I was recently asked to write a promotional feature about the annual neo:artprize, highlighting the artist-led ethos behind it. I visited neo:studios in Bolton, where I was given a tour and talked to neo:artprize co-founder Jason Simpson about the growth of the group and the way in which they have built up an alternative art scene in the town. Every artist wants to get their work seen but it can be difficult for emerging artists to feel that they’re reaching out to an audience and not making art for non-existent viewers or indifferent eyes. It was the desire to showcase its members’ work to a wider audience that motivated Bolton-based studio group neo:artists to establish the neo:artprize in 2012, an acclaimed open submission competition which attracts artists from across the globe and is judged by leading figures in the art world. Neo:artists comprises 38 artists, with a wider membership of 80, working across all media, who are based around a sociable two floors of former office space in Bolton town centre and have access to impressive shared resources such as a print room and wood workshop, in addition to ceramics, sculpture and photography facilities at the University of Bolton. Ranging from graduates from the university’s MA courses to artists with many years of exhibiting and organising experience, there is a waiting list for the studios. It’s not just about making – members also curate, exhibit in and invigilate the group’s own gallery, a surprisingly spacious former retail unit in the Market Place Shopping Centre across the road. Neo:gallery has hosted more than 200 shows over the past six years and previews attract hundreds. In a town where many of the public think state funding for the arts represents a diversion of money from services such as hospitals, Jason takes genuine pleasure in increasing enjoyment of art among local people. “We are the contemporary art scene in Bolton,” he explains. “A large number of adults come in who have never been to an art gallery before, so there’s a lot of resistance. Young men wander in on the phone and ask us ‘what’s this?’. The most common comment is ‘my six-year-old could have done this’. But kids get the concept and they explain it to their parents. If we keep doing this we can have a massive impact on a generation in Bolton.” Jason sees the neo:artprize as ”a natural progression”. Now in its third instalment, the prize alternates biannually with the neo:printprize, acknowledging the strength of the group’s print room. 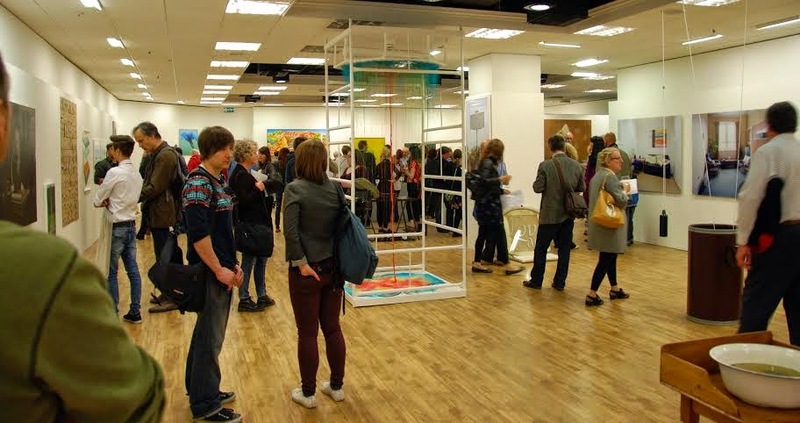 Although artists from Greater Manchester and the North West have been well-represented in previous years’ shows, including writer, artist and curator Mike Chavez-Dawson and Manchester Metropolitan University MA graduate Hannah Leighton-Boyce, there have been submissions from Germany, America and Malaysia so far this year. As well as giving artists from the region greater exposure by going beyond geographical boundaries and showing “you don’t have to be in London or Manchester to succeed”, it brings new work, artists and ideas to Bolton. Neo:artprize also highlights the value of financial support for the arts and the necessity of improving the “affordability of being an artist”. It offers much-needed resources in the form of not just a cash prize but grants for materials, donated by local businesses, and a neo:residency prize. The winner of neo:residency accesses a twelve-week residency in Bolton, tapping into an artists’ ecology that includes not just studio space at neo:studios but a close relationship with the University, which Jason describes as a “win-win situation”. 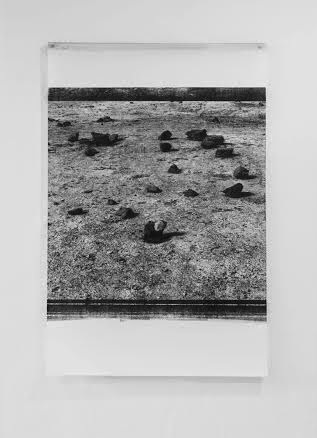 In the case of printmaker Dana Ariel, who undertook the residency in between finishing her Master’s at London’s Slade School of Art and returning to the school to start a PhD, it enabled her to focus on creating work outside the pressures of an academic course and to explore a new direction in her practice. As well as becoming immersed in a new place – Jason taught Dana, who is from Israel, “how to drink real ale” – Dana took the opportunity to network and show her work in the North West, as well as gaining experience of delivering masterclasses and artists’ talks with local students, blossoming into an ongoing relationship with the town. The deadline for submissions to the neo:artprize is Monday 18 May 2015. 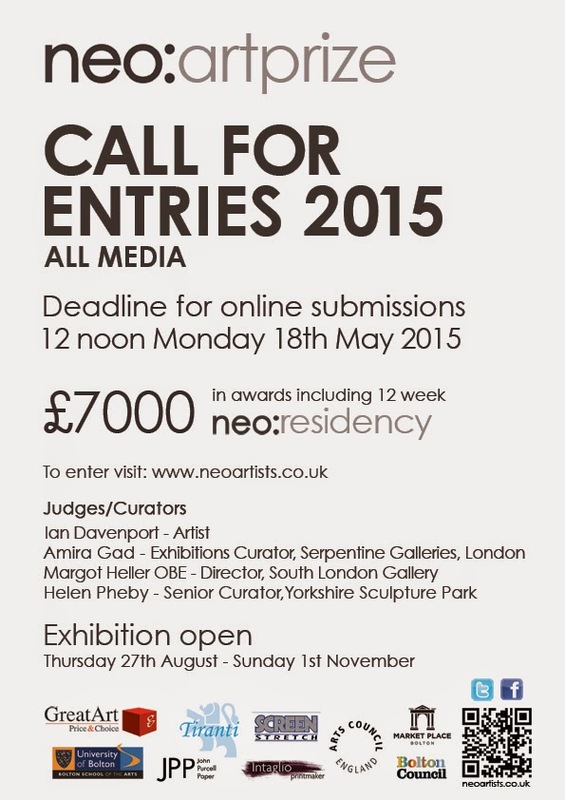 For application criteria, terms and conditions and to upload work online, visit www.neoartists.co.uk/artprize2015.asp. Finalists will be exhibited at neo:gallery from 27 August-1 November 2015. Last year I started attending the meetings of a new publishing and discussion group called Manchester Left Writers and I recently, finally did my first piece of writing. It's a collaboration with Steve Hanson focused on our experiences of the A6, one of the busiest roads in and out of Manchester and the main link between Manchester and Stockport, as part of a series called 'Precarious Passages'. 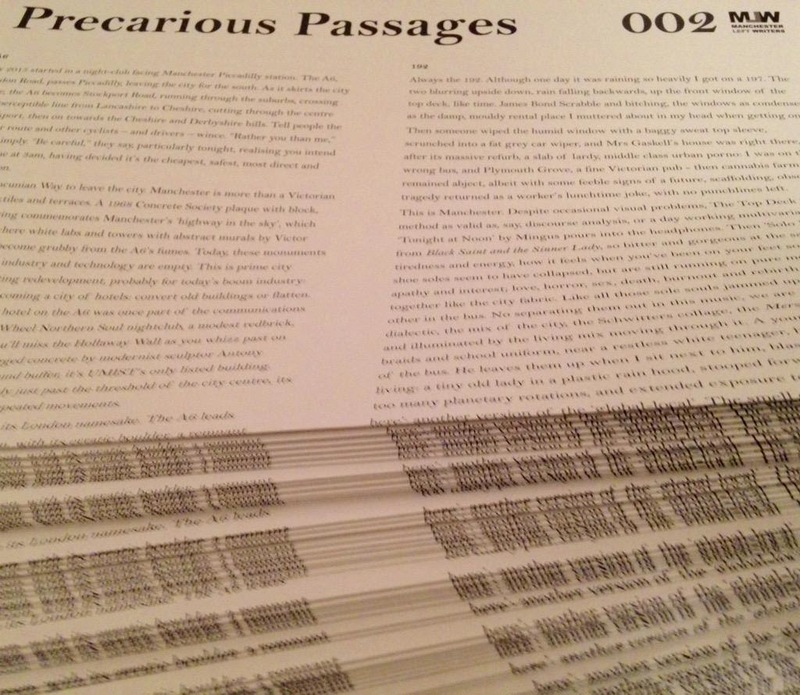 Precarious Passages act as poetic call and responses between two writers, reflecting on the everyday lived experiences of our times and our cities. I spent about six months thinking about my experiences of the A6, which I cycle down between two and five times a week to and from Manchester (it's pretty central to the way I experience and pass through the city), and compiling my thoughts and observations (some of this is now out-of-date, eg Tesco Metro's been back in action a while now, and the Arcadia's gone). As a result what I wrote (posted in full below) was inevitably far too long and rambling. A heavily edited version appears side by side with Steve Hanson's musings on experiencing the same road on the 192 bus, one of Manchester's major (and notorious) bus routes. The full version, PP002, can be accessed online here. There are also paper copies available, which will eventually be distributed at various points along the A6. 2015 started, like so many nights have ended in this city, with me dancing by myself on a near-empty dance floor in a night-club where music never got much better than the 1980s. 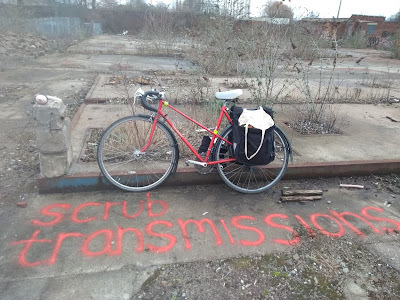 The club faces the furthest platform of the city’s mainline railway station; indeed, it looks likely that the station’s imminent expansion will be the end point of the venue’s years of decline. Past the station runs the A6, London Road, heading out of the city for the south. As it goes beyond edge of the city centre, the A6 becomes Stockport Road, heading for the suburbs, crossing the imperceptible line from Lancashire to Cheshire, passing through the centre of the next large town along, Stockport, then on towards the hills of Cheshire and Derbyshire. Tell people you live in Stockport and the A6 is your route into town and other cyclists – and drivers – wince. “Rather you than me,” their faces say. “Be careful,” they say to your face, particularly, as tonight, when they realise that you fully intend to cycle home, post-dance at 3am, having weighed it up and decided that cycling is the cheapest, safest, most direct and quickest option (the local rail operator is unofficially known as ‘Northern Fail’). To leave the city you pass under the Mancunian Way. Manchester is more than a city of mills and textiles, redbrick and the humble terrace. Yes, Manchester is a Victorian city, but it could, it should, be seen as so much more than this. Manchester’s ‘highway in the sky’ won a 1968 Concrete Society Award, commemorated in block, almost Pop, lettering on its own unlikely concrete plaque. It soars over Oxford Road and Upper Brook Street as the bustle of student life goes on below, coming down to land at the heart of UMIST (aka North Campus, once the University of Manchester Institute of Science and Technology). At UMIST, the white-painted labs and towers, complete with subtly abstract murals by the likes of Victor Pasmore, have become grubby through the fumes of arterial roads like the A6, which pass by. Today, these monuments to science, education, industry and technology are static and empty as the university concentrates its resources on the southern campus areas. This is now prime city centre real estate awaiting redevelopment, probably to contribute to the sacred industry in Manchester today: hotels. More hotels. Manchester is becoming a city built on hotels: convert old buildings or flatten. The sweeping, office-like Macdonald hotel on the A6 was once a piece of the communications industry but is now a hotel. The old Twisted Wheel Northern Soul nightclub back down the A6 in the city centre, a modest redbrick, wasn't so lucky. If the rest goes, the Hollaway Wall, at the London Road end of the A6, is all that will stand of UMIST. Blink and you’ll miss it as you whizz past on wheels. A grubby chunk of jagged concrete wall which has both a sculptural and a functional role as a sound buffer, it’s listed due to its association with modernist sculptor Antony Hollaway, who was innovative in his time but not a household name. This was the future, but it was cut short. The Mancunian Way comes to an abrupt stop just past the threshold of the city centre, a diving board going nowhere. Today, its underpasses provide havens for skaters and the homeless as the city goes on overhead at a different speed. Then on past Downing Street, a far cry from its London namesake. This is the inner-city. The A6 leads into Ardwick, and a small green patch among the fumes, Ardwick Green, with its erratic boulder, a remnant of an ancient time. Georgian, genteel, tranquil and elegant, the Green and its surrounding streets feel like a lagooned island from a different age. Once, this was the edge of the city’s sprawl and not a triangle caught between a petrol station with a Tesco appended onto the side, derelict industrial buildings, and an insalubrious-looking nightclub. Past Big Bird, the local Jamaican takeaway van, and Ardwick turns into Longsight, with modern St Luke’s Church standing like a sail on the border between the two. In 2012, conceptual artist Martin Creed tried to herald the start of the London Olympics by getting the entire country ringing with bells for three minutes from 8.12am on a Friday morning. It is fair to say that Manchester did not ring with bells. St Luke’s was the only church in the city to take part, and it turns out St Luke’s doesn’t even possess its own bells. At 8am the vicar reached into a wooden cupboard, pulled out a cassette tape marked ‘Births and marriages’ on one side and ‘Deaths’ on the other, and a portable player was set to blast out the sounds of a dying format and a dwindling institution. A couple of ladies emerged in pink fluffy dressing gowns, venturing onto the front door steps of nearby houses, more confused and affronted than aware they were taking part in what was meant to be a mass, participatory public art project. The non-event was celebrated unofficially with a Twitter hashtag: #noneofthebells. Conceptual art doesn't often venture this far out of town. Across the road is Sunny Lowry Way, not a street but a passageway leading into an estate, named after a local heroine associated with nearby High Street Baths who swam the channel and taught many schoolchildren to swim. Famous for a training regime of 8-egg omelettes, and press images showing her brawn cutting through the waves, a larger than life personality has been reduced to a high-up sign on a nondescript road. Sunny’s generation would find much of this area unrecognisable. Slum clearance. Moving out to Cheshire. On the left stands Daisy Mill, one of the few reminders of the mills and factories that once dominated the skyline. One hulking mass of a building survives, still hoarding all that land, which the council hopes can soon be knocked down to make room for a new school. There’s a population boom. Manchester is a fast-growing city. I feel for Sunny. Cycling the A6 feels like a feat of endurance too, at times, a gradual uphill slog. I’m never quite the fastest, overtaken by the hi-vis, year-round shorts wearing brigade. Stickers on buses warn ‘Do not overtake on the left’: hang back, or stick your arm out to pass. Buses have ploughed these roads for years, leaving ridges like black volcanic lava which has melted and set in strange formations. This combines with pot holes, broken glass and hub caps to make it a bumpy ride, with bits of old carpet and abandoned umbrellas, scrunched up like the defensive position of a dead spider, gathering at the side of the road. Other bikes crawl along, black clothes and no lights. Do they have a careless attitude to safety or are they just ignorant? Many glide through the red lights but for me, on this stretch of road, traffic lights provide a welcome respite. A chance to stop, to blow my nose and breathe. You lurch to a stop and wheedle towards the Advance stop line, a dedicated space for cyclists to make themselves seen by positioning themselves ahead of the traffic at junctions: there are supposedly fines for those whose wheel crosses the line. However, it’s something taxi drivers need not observe, exempt, as they are, from all the rules of the road. A man at the junction has stopped too, buffered from the cold and wind in corduroy, a wool hat and a puffer jacket. He holds up a sign, “Jesus Christ: the same today, yesterday and forever.” Optimism, obliviousness – or sheer blind faith? Past Plymouth Grove, where Elizabeth Gaskell's house once stood at the edge of the city. Where we now walk was once all farms and opposite is the Plymouth Grove pub, once home to a modern-day cannabis farm. It’s next to Grove Village, New Labour’'s flagship PFI, where new homes back right up to the main road. You get the sense that these too were political ideas just passing through. On the main strip in Longsight, the confetti of city life – the rainbow hues of free advertising inserts for discounters like Asda and nearby Lidl – blows across the pavements, and skitters across the road. Foreign language communications dance with local news, but nobody's paying any attention to any of them. In high winds, a carrier bag blows into my back wheel. I stop and spend a good ten minutes disentangling disintegrating plastic fragments from my greasy chain. A number of shops offer threading and waxing,the beauty industry making money off women's insecurities, but it’s also a place for a spot of shopping for those in the know. Authenticity. “Go to Longsight for the best coriander,” I’m told. They sell it by the bunch. Better than the flat, sad, plasticky leaves sold by the greengrocers or the supermarket down the road. The smell of fresh produce mingles with the dingy street smell of grease and grime, incense mixed in with clay ovens. The locals use a method of crossing, particularly when emerging from the spaces in between parked cars, or from behind buses, I mentally term the ‘Longsight dash'. It’s practised by those with no time nor energy to walk to the crossing: young men, groups in religious dress, mothers and grandmothers clutching tiny hands in oversized uniforms, and the pushers of prams. We all know the pedestrian code: look both ways before crossing the road. They look. They see you, and decide to cross anyway. The young men in particular have perfected the move: head down, body bent slightly, ready for a dash propelled partly by shame, partly by defiance. A large sign advertises Elliot's Car, van and helicopter hire. This area is transitory, a place that is passed through by a changing population. As you get into Levenshulme you pass numerous buildings reappropriated as ‘colleges’ offering 'ESOL for a diploma’ and, more importantly ‘ESOL for citizenship', ‘Home Office-approved’. “Welcome to your new job.” An arts and technology college, a school for business, performance and music, in what appears to be a converted pub, for those who don’t know what they want to do but know they that they should do something. At one, above fast-food joint ‘Foodies’, English learning takes place with the pungent smell of onions and what increasingly seems to be the national dish of choice, fried chicken, in the background. Knife and fork cross arms in a defiant gesture with a sticker in each window urging: ‘Don't Cook, Just Eat.’ The local Tesco Metro has been ‘closed for refurbishment’ for some time, though this is the understatement of the year. The roof was rendered a skeleton by fire, and the front was been hidden behind hoardings for several months, meaning the groups of schoolgirls waiting to cross the road in hijabs every morning had to find somewhere else to get their pre-class snack. Nearby the former Arcadia skating rink, being flattened for a new sports centre and swimming pool, has a hidden claim to fame. The most famous tramp of them all, Charlie Chaplin, may have once attended Bennett Primary School down the road in Ardwick. Chaplin's Wikipedia page neither corroborates nor denies this. It merits no mention – a passage from his life brushed from memory, or urban myth, local wishful thinking? What's certain is that he was drawn back later, to skate at the Arcadia. The site of the suburb current baths sits opposite Levenshulme Library, incubator for one of Levenshulme’s more famous sons, architect Sir Norman Foster who, too, seems to dwell little on his Mancunian past. He too just passed through. Local to global. Global to local. The area is seen as up-and-coming now, but many of the shops are still improbably specialist: ‘Snooker & Pool tables and accessories’. Manchester might be seen as a big city to some, but to me it feel like a village. I receive emails from colleagues saying they saw me ‘whizz past’, exchange a fleeting smile with acquaintances, get shouted at from moving cars and say a quick ‘hi’ as friends out walking their dog stop at the traffic lights. But there’s still a near-constant sound of sirens. It’s disorientating as they creep up behind you, sounding like they’re coming at you from all angles. I’ve started to feel like I hear them at all times now, a kind of sensory perception before the even start, like an early warning, a phantom limb. Another sensory overload comes from the party car, pulling up alongside you at the junction with its blacked out windows, emitting the rich, spicy smell of cannabis and hip-hop rhythms over bass-heavy beats. You hope the driver's not high off passive smoking. The lights change. The streamline shape is already straight off the mark, zooming off into the distance, as the cars behind struggle to jerk and splutter back into gear. As the A6 creeps into suburbia, the road widens, a gradual incline towards those hills in the distance. Victorian house conversions, flat piled on top of flat, thin out into neat, polite 1930s semis for families in cul-de-sacs and back routes, with the odd solid detached. The houses start to retreat further back from the road. No-one is going in or out. They never do. Their lives are lived to the rhythm of commuter jobs – and perhaps they get all their shopping delivered too. The street signs change as you leave Manchester to enter another town. Stockport Road becomes Wellington Road North. But it's the smell that says, more than any municipal road sign: 'You are now in Stockport.' As you pass the McVitie’s factory on the edge of Stockport, industrial strengths and quantities of classic baking ingredients mingle in the most intense olfactory hit of sugar, butter and chocolate chips you'll ever experience. Digestives, the nation's favourite, heightened into a smell that is overpowering and all-pervasive. The next day I read in the Manchester Evening News that there was a new year’s drama on the Stagecoach bus I’d nearly caught. Held up by a gunman in Longsight. Perhaps it’s better I took the bike after all.